PORTLAND, Ore. (PORTLAND TRIBUNE) -- If it ever gets built, one of the trickiest tasks facing the Southwest Corridor MAX line proposed on Barbur Boulevard will be providing some kind of connection to Oregon Health & Science University and the various other medical facilities located 300 feet above the route. The decision is scheduled to be made Wednesday, May 8, by the project steering committee. The Gibbs Street station is expected to be the second busiest along the proposed route. There are 21 centers and institutions on Marquam Hill, with 11,000 workers at OHSU, 3,000 at the Veterans Administration hospital — and 19,000 daily trips to those facilities. And many of the visitors will have medical and mobility issues. In the very early estimated budget for the project, a maximum of $20 million is projected as the cost of building what's called the Marquam Hill Connector. A second tram to the top of Marquam Hill already has been ruled out. TriMet staff has narrowed the original list of nine options down to three: an elevator and a bridge; an elevator and a pedestrian tunnel; and an inclined elevator. 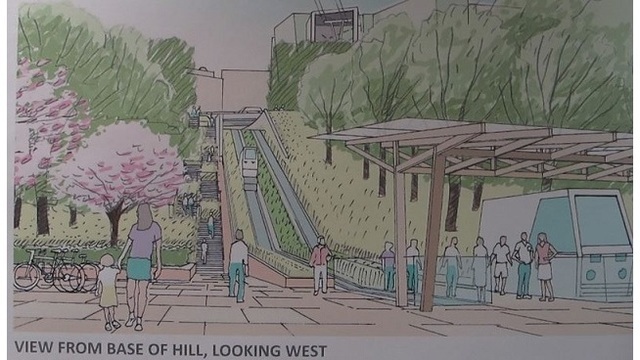 The first option would resemble the elevator at the east end of the tram line in South Waterfront that connects to the Darlene Hooley Pedestrian Bridge over I-5. This is the least expensive option at an estimated cost between $15 million and $25 million. The elevator tower would rise 108 feet from the area near Barbur Boulevard and Southwest Gibbs Street. The bridge would be about the length of two city blocks. It would take pedestrians as far as the Terwilliger Boulevard entrance at Southwest Campus Drive. The elevator and bridge could operate 24 hours per day. Option No. 2 would replace the bridge from the elevator with an enclosed tunnel for light rail passengers on their way to Marquam Hill. This option is estimated to cost anywhere from $55 million to $125 million. Staff cites "the high risk of cost and budget overruns" with this option and raises the possibility of a user fee being charged. The tunnel in this option would be the length of three-and-a-half city blocks. It, too, would probably only go as far as Terwilliger Boulevard. Hours of operation are uncertain. Option No. 3 would be a single vehicle ride to Terwilliger Boulevard aboard what's called a funicular/inclined elevator. Basically, this would be a relatively short but steep railway from Barbur and Gibbs. This is estimated to cost between $35 million and $45 million. Hours of operation would probably be limited and attendants would have to be on hand. A user fee is probable. "It's pretty complex, like a series of chutes and ladders getting people to where they're going," TriMet's Carol Mayer Reed recently told the steering committee. Some nearby residents already oppose the third option. "Inclined elevators are nice but it will cut all the vegetation down on Terwilliger Parkway. That's not what we want. Terwilliger Parkway is a park, it's open space and it's not to be built on," Leslie Pohl-Kosbau said at a TriMet-sponsored open house April 10, a gathering designed to display the various options. She's a board member with the Hillsdale Neighborhood Association and has been following the planning process closely. "I'm interested in talking about the elevator and bridge and what that would do. I want to make sure people are safe. I'm not sure about being exposed to the elements because there will be some sick people," Pohl-Kosbau said. Her preferred method for getting up the hill from the Gibbs Street station is the elevator and enclosed tunnel. "I know it's expensive but in the long run it makes sense. Look what we've done at the zoo — it's paid off," she said. The entire 12-mile light rail line from Downtown Portland to Tualatin is projected to cost somewhere between $2.6 billion and $2.9 billion. Local voters could be asked in November 2020 to approve an increase in property taxes to partially fund it. Half of the remaining funding would be sought from the Federal Transit Administration in Washington, D.C.